Take in the mysterious essence of Ciutadella´s streets or let yourself be carried away by the breeze of Mahon´s Port... Menorca is a destination for travellers who want to live an authentic experience in a natural refuge of quietness, peace, Mediterranean air and familiar ambiance. An adventure for sportspeople, a sacred nook for gourmets and the most entertaining theme park for a holiday with children. From Grupotel Hotels & Resorts we have designed a tour for you to feel, smell, taste and listen to the authentic heart of this Mediterranean paradise. Follow us! Discover Menorca step by step, going through its endless paths to stunning nooks that will conquer you from the very beginning: unspoilt coves, lighthouses, cliffs, the countryside, hamlets and ports. One of those indispensable paths is Camí des Cavalls, an old route around the island that will allow you to discover the best kept secrets of the Balearic Islands. Get lost in the most special coves of Menorca -Cala Rafalet and Cala Escorxada-, where you just need to worry about enjoying. Menorca boasts of being Natural Reserve of the Biosphere and offers its visitors a perfect outdoor experience, among idyllic landscapes, for recovering the balance of body and mind. The island of Menorca has a strategic location in the Mediterranean which made it the object of desire of many cultures, the same ones that left their mark on the island´s traditions, its people and its lifestyle. 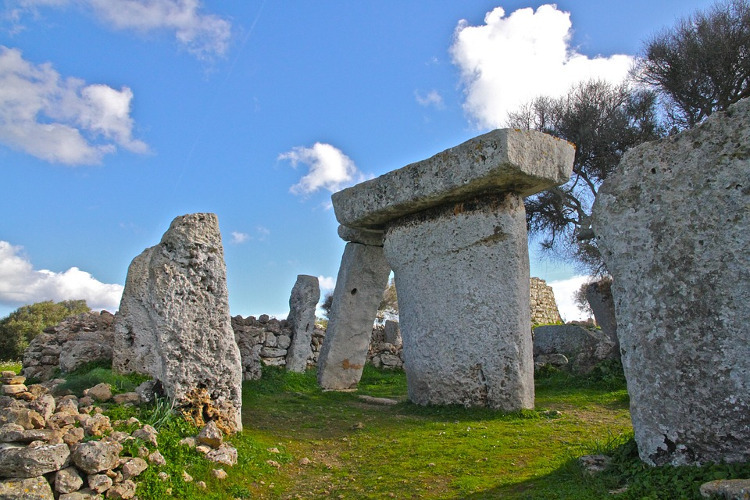 Visit the talaiotic archaeological sites of Menorca and discover the origin and essence of this island. Dedicate a day to Menorca’s history, bound to its archaeological sites, and do not miss the opportunity to visit Ciutadella. The talaiotic sites: Menorca cannot be understood without the remains of its primitive civilisations. Although there are different archaeological sites in the island that speak of that past, some of them stand out for their historic importance, like Naveta des Tudons (between Ciutadella and Ferreries) or the settlements of Talati, Trepuco and Son Catlar. Las Taulas: Las Taulas are Menorca´s native talaiotic elements, so they are worth a visit. Their most representative elements are the Torre Trencada and Torre Llafuda. It is a perfect family plan for you to discover the historic side of the island. Monte Toro: Menorca’s highest peak is a hill right in the middle of the island, in the charming municipality of Es Mercadal. There you will find one of the most venerated sacred places by its people: the sanctuary of El Toro´s Virgin, patron of Menorca. Santa Agueda castle: according to history, this castle located in the municipality of Ferreries was the last abode of the Arabs in Menorca, before Alfonso III recovered the island for the Crown of Aragon. This is one of the most rural and traditional areas of Minorca, so its landscapes deserve more than a picture. Craftwork route: Nou Street in Mahon is the nucleus of craftwork in the island, an ideal place for you to enjoy a morning walk around the craft stores, with traditional and autochthonous products. Tapas around Ciutadella: apart from its stunning old town (a gem of the Mediterranean historic heritage), Ciutadella´s Port offers the best tapas route in Menorca. The gastronomic tradition of this island is an authentic guaranty of enjoyment, so no matter where you stop at, you will always find a delicacy that conquers your palate. Trekking around the island: the Camí de Cavalls has become one of the most famous trekking routes of the Balearic Islands. With its charming nooks and exceptional views, this option is perfect for those who want to enjoy a nature day with friends or family. The festivities of San Juan in Menorca: the great festivity of Minorca is celebrated on the 24th of June. Sant Joan is one of the most relevant events of the Balearic Islands, which brings people from all around the world together. The celebration combines horse riding exhibitions, traditional dances, music and gastronomy. A visit to a distillery of Menorcan gyn: the British heritage of the island is evident in many aspects, but especially in its gin. Menorca produces its own gin, a drink known as gin xoriguer which is a light version of traditional gins and which perfectly combines with natural lemon juice to create locals´ favourite cocktail: the pomada. Try Menorca´s caldereta: Menorca must be savoured through its lobster stew in any of the terraces of the island. Apart from being one of the most traditional dishes, it is a recipe of sea taste perfect to be accompanied by a fresh white wine or a glass of champagne. Menorca is an island that offers quietness and shelter in itself, but it also features really special refuges, far away from the most tourist areas. Nooks like Cala Canutells, which despite being just 10 km away from the centre of the capital —Mahon—, offers the intimacy and quietness perfect for a romantic holiday as a couple or for some relaxing and leisure days with your children. Cala Canutells is located at the mouth of a stream, which makes it a small haven of peace on the south-eastern coast of the island, between Cap Gros and Na Picada hill. Surrounded by Mediterranean nature, it lies close at hand from charming places like Binibeca, Sa Raganeta and Es Caparros. From Grupotel Hotels & Resorts we invite you to discover this fabulous area. Mediterranean baths with your family: the calmness and safety of this coast have made Es Canutells one of the most recommended nooks for summer family trips: if you have children, you will enjoy like never before and without worries in the waters of this cove. Sea routes in Calescoves: the most stunning cliffs of Menorca are close at hand from Es Canutells, in the area known as Calescoves in reference to its whimsical orography, full of rocks shaped out by the sea, its cliffs of more than 70 metres high and its typical Menorcan vegetation. The village of Binibeca: despite its appearance, the village of Binibeca is not an old fishing town, but a residential area built in 1970 in the likeness of a fishing village. It invites its visitors to have a walk around its small houses, enjoy its familiar ambiance and comfortable services. Ciutadella: all the villages of Menorca are worth a visit... but Ciutadella, the old capital of the island, is an essential stop during your trip. Its old town is of an incomparable beauty and wandering along its intricate streets, its squares and its arcades is an authentic privileged experience. Under the arcades there are several recommendable bars and restaurants, ideal for a tapas route, for savouring a craft beer, a Xoriguer gin and the best Menorcan wines. A destination made for families with children. Cala´n Bosch is one of the most pleasant beaches of Minorca for you to enjoy a relaxing and entertaining holiday at the shores of the Mediterranean and with all the services within your reach. This cove of turquoise waters, surrounded by nature and close at hand from the fabulous Cap de Artrutx offers you all the necessary amenities. The area of Cala´n Bosch, located in the south-east of Menorca and within a 15 minute drive to the centre of Ciutadella, features, apart from a stunning beach, a marina and a wide offer of bars and restaurants where to savour some of the best dishes of the famous Menorcan gastronomy. From Grupotel Hotels & Resorts we offer you some useful information so that you make the most of your holidays. Entertaining days with your children: the quiet and familiar ambiance of the area of Cala´n Bosch makes it the ideal destination for a holiday with children. In the surroundings of our hotel Grupotel Aldea Cala´n Bosch there are several playgrounds and tours for families. Gastronomic tour around Ciutadella: the restaurants of the fabulous Ciutadella are a gourmet option for the most demanding palates. They offer all type of typical tapas as well as traditional dishes, such as the caldereta de langosta (lobster stew), typical from Menorca. Sailing and water sports: Cala´n Bosch´s marina offers a wide range of water activities, from rental of boats and catamarans with or without skipper to the practice of diving. The best option is to register in any of the schools of the area or book a session with an instructor, either for kayaking or scuba diving. Artrutx lighthouse: it offers one of the best views of the southeast of Menorca and, on clear days, one can even see Mallorca. Sunsets are an authentic marvel here. One can get to the lighthouse by car, bike or on foot. The walk is pleasant and the surroundings stunning, with the Mediterranean as a backdrop. The quiet area of Son Xoriguer, with a beautiful beach of crystal clear waters and familiar ambiance, is one of the most esteemed nooks of the south-eastern coast of Menorca by those who travel with children. It is an immaculate destination where to relax, rest, eat healthy and have fun with your children while enjoying the excelled climate of Menorca. Son Xoriguer is a valued refuge by tourists from all around the world for summer holidays. Its proximity to the centre of Ciutadella (11 km away) and to areas such as Cala´n Bosch, Cap de Artrutx, Ferreries and Cala Galdana make Son Xoriguer one of the most comfortable holiday areas and with the most services in Menorca. A place from where to discover the rest of the island and enjoy a different and perfect plan every day. From Grupotel Hotels & Resorts we offer you some tips. 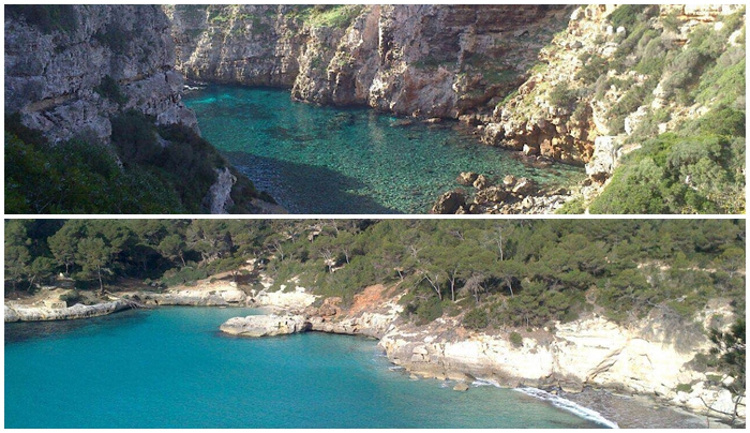 Discovering Cala Parejals: from Son Xoriguer beach, a welcoming cove of fine white sand and little swell, you have access to a section of the Camí de Cavalls (a coastal tour around the island) which connects to a beautiful cove of crystal clear waters called Cala Parejals. And a bit further, the Cova dels Pardals. Bike tour with children: from our hotels in Cala´n Bosch and Son Xoriguer you can access to a route which connects Cap de Artrutx with the beaches. It is an easy, safe and quiet route with a beautiful landscape ideal for children: it starts at the beach, direction Cala´n Bosch, and finishes at the lighthouse. Diving among coral reefs: just in front of Son Xoriguer’s coast we find one of the most emblematic reefs of Menorca´s sea, the so-called Cap de Porc reef, which has become a meeting point for diving lovers for its active and colourful submarine life. Sunset in Cap de Artrutx: with its svelte 45-metre-high lighthouse facing Majorca´s coast -which is clearly visible on cloudless days-, this cape, indefatigable sentry of the boats arriving at the port, offers the best sunsets of the entire coast of Ciutadella.